There is not a particularly large selection of sustainable, prefabricated solutions for the energy renovation of buildings in the Nordic markets. The purpose of the project Nordic Built Active Roofs and Facades is to develop a concept for new ways to make prefabricated and building-integrated solutions for sustainable construction. The project is a Nordic cooperation under the Nordic Built program. The ambition is to create a Nordic network for the energy renovation of key players. The concept will result in prefabricated solutions like facades or roof elements that will be brought to a building and can be tailored to the specific needs of the building. The project works with insulation, windows, heat recovery, ventilation design, building integrated solar panels and Smart Grid. The concept will connect Nordic Built principles for sustainable and environmentally-friendly design, architecture and construction in the Nordic countries with Active House specifications, which combines energy efficiency with health and comfort, indoor climate and environment. The goal is to showcase solutions in a number of housing estates and school projects in the represented Nordic countries, such as the integrated use of solar energy, and show that such solutions have advantages for residents, building owners, contractors and consultants. AVENTA, Cenergia, Københavns Ejendomme, Demos, Ecovent, The Association for Sustainable Cities and Buildings, Gaia Solar, Gate 21, Hoyer Finseth, KAB, Kuben Management, Solar City Denmark, SolarPlan, University of Iceland, VTT, WSP Group and ZED Consulting. The project is funded by: Nordic Innovation with 2.27 million Norwegian kroner, EUDP with .,96 million Norwegian kroner and by the University of Iceland and the Swedish Energy Agency. 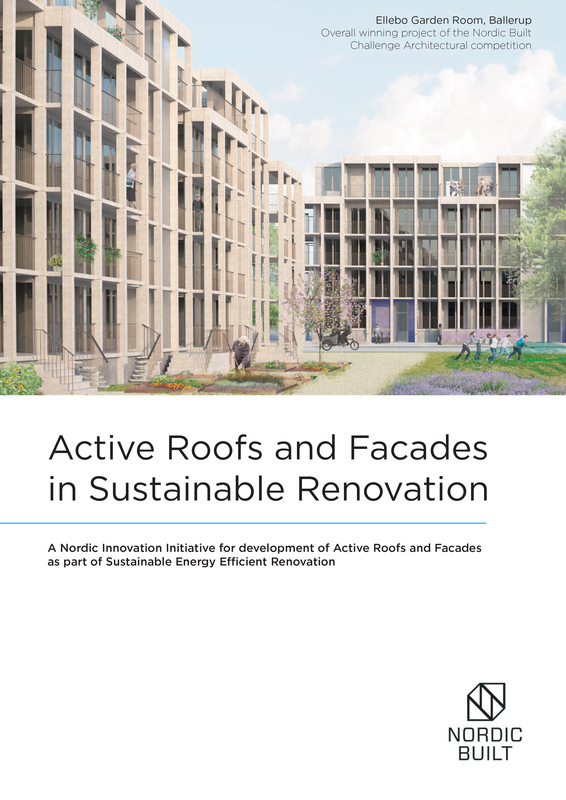 The communication of the Nordic Built – Active Roofs and Facades in Sustainable Renovations is handled by Gate 21. Therefore the ‘homepage’ of the project is hosted at www.gate21.dk. Read an e-book about the project by clicking on the image.